Learning how to draw hands is one of the most important things you can do if you want to be a good figurative artist. But why are they so difficult to get right? And what if there was a simple way to draw hands that didn’t involve years of study and piles of textbooks? Relax. 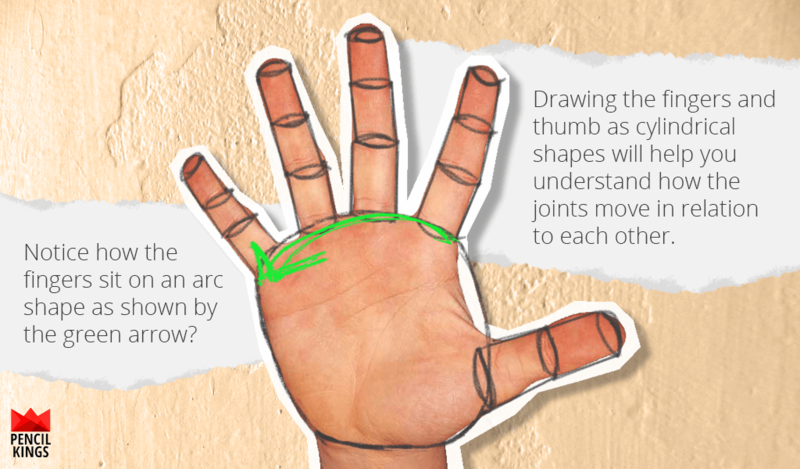 After reading this article, you’ll have a much better understanding of how the hand is constructed and how to draw it. You don’t have to get baffled by science or learn lots of complicated terms that are as difficult to pronounce as they are to remember. 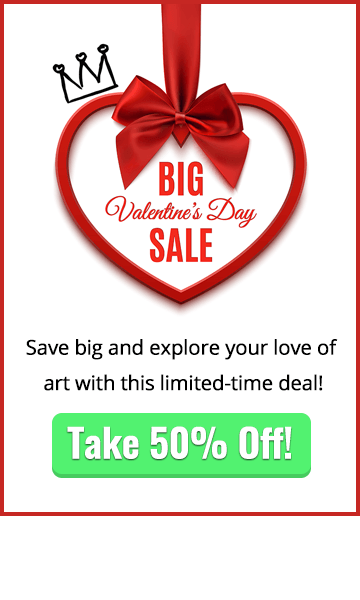 So, are you ready to learn how to draw hands without the hassle? All you need is a pencil and some paper to get started. Illustration 2: See how the bones in the illustration match up to the bones in a real hand? Now, let’s take a look at how this diagram relates to a real hand. 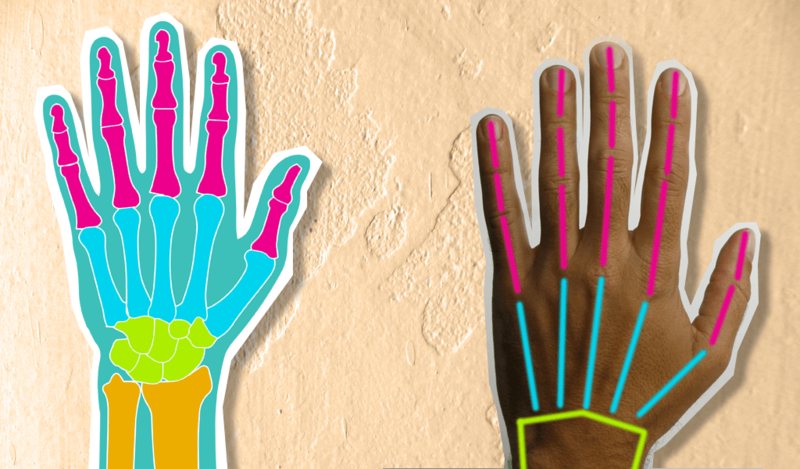 The colored lines on the image of the real hand are color-coded with the bones of the hand in the diagram. Now you know how the hand is constructed, let’s get started with some basic shapes and proportions which will help you draw it more easily. For this first exercise, you’ll be drawing the palm side of the hand. If it helps, imagine this as being similar to the shape of a steak (or a nut cutlet if you’re vegetarian!) Also, because this ‘steak’ shape isn’t completely flat, you’ll need to draw it with some depth like in the illustration. Drawing and thinking of this shape as a 3D object will help you when you come to add the fingers and will stop your drawing from looking too flat. Using the illustration as your reference, practice drawing this shape as many times as you like until you fully understand it. Once you feel totally confident with drawing this shape, you’ll be ready to move onto the next part of learning how to draw hands. Drawing them this way will help you establish where the joints in the fingers are, and teach you to see the fingers as 3D shapes instead of flat, 2D shapes. Now look at your own hand. Notice how your fingers aren’t completely straight, but bend slightly towards the middle finger? This is a subtle detail, but it’ll make a huge difference to how realistic your drawings of hands look. The other important thing to remember here is how the fingers are attached to the palm. Rather than being attached in a straight line, the fingers actually sit on a curved line or arc that goes downwards at the little finger. You also need to notice how the thumb usually sits at a slight angle when compared to the other fingers. It’ll look a little unnatural if you draw it looking face-on like the other fingers. Using the image above as your reference, practice drawing the hand using these simple shapes. Keep doing it until you start to become more familiar with the structure of the hand and its proportions. 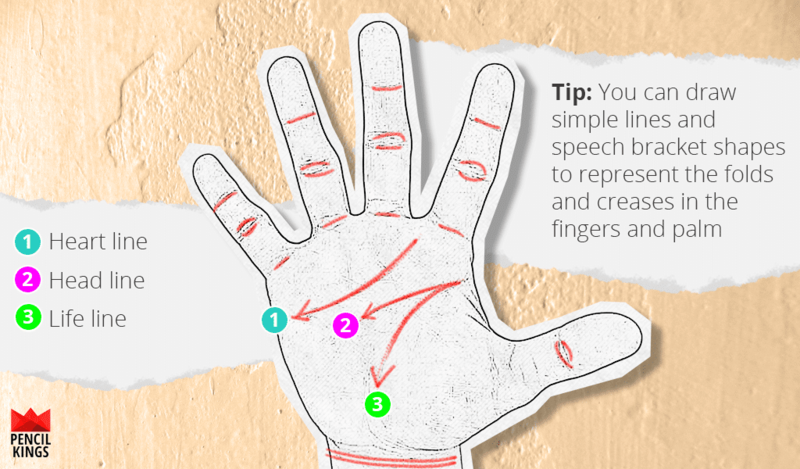 To make your hand drawings look more realistic, you’ll want to add some crease lines to the palm and fingers. Take a look at your own hand and see how these lines curve across the surface of the palm. The head line (3) and the life line (3) both start from the same point at the base of the forefinger. The heart line starts right between the forefinger and middle finger, and then curves down towards the outer edge of the hand. It stops roughly level with the base of your thumb. If you look at your wrists, you’ll also see some creases. These two lines are known as your ‘bracelets’ and they curve around the cylindrical shape of your wrist. You can add these if you like, but it’s not essential – especially if you’re just starting out learning how to draw hands. 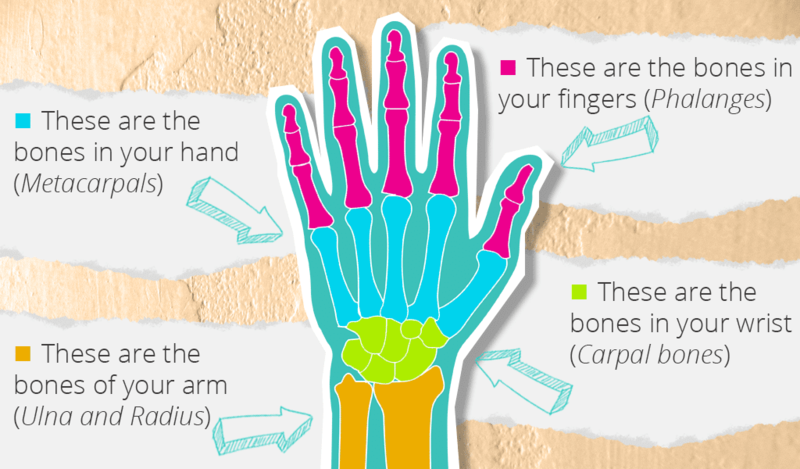 Remember how each of your fingers is made up of three bones? Well, it probably won’t surprise you to learn the crease lines on your fingers are at the point where each of these bones meet. Take a look at your own fingers. Notice how the crease lines in the fingers also follow an arc shape like the rest of the hand? Go ahead and sketch these lines in, like in the illustration above. This is another small detail that will make a big difference to how realistic your drawings look. Once you’ve got the hang of drawing hands from the palm side, why not try drawing them from the other side, otherwise known as the back of your hand? 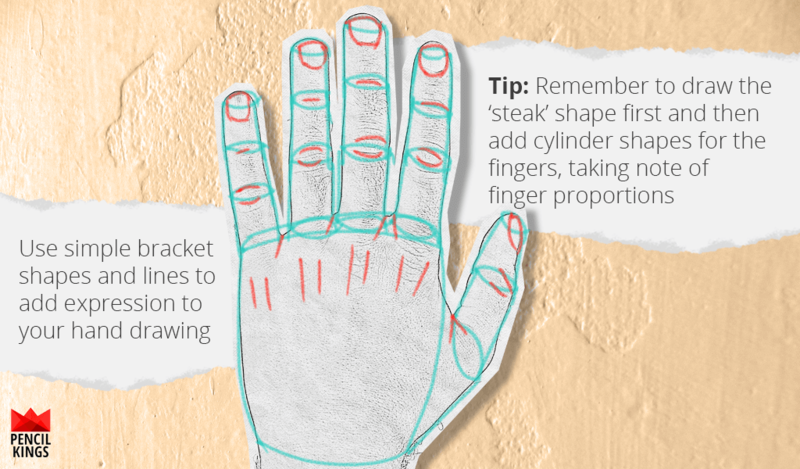 Start off by drawing the same basic ‘steak’ shape for the main part of the hand. Then, taking note of the proportions of the fingers and thumb and the joints between the bones (as in Illustration 4), sketch in those basic cylinder shapes to represent the fingers. The fingernails are often overlooked when learning how to draw hands, but they’re actually a pretty important feature – especially if you’re drawing or painting hands close up. Not only that, but the fingernails can also be used as a useful reference point with regards to the proportions of the hand. For example, the top of the index and ring fingers roughly lines up with the bottom of the fingernail on your middle finger.Pro Tip: Take a good look at your own hand and fingernails. Are they long, short, painted or in need of a little manicuring? If looking at the hand from the top, the fingernail on the thumb will always be seen in a three-quarter view. This is because of the way your thumb is attached to the rest of your hand. The knuckles sit at the base of each finger, and also sit on an arc shape. When the hand is relaxed, the knuckles usually aren’t too prominent. A simple way to draw these is to add two straight lines or curved lines like speech brackets at the base of each finger. Just like with drawing the palm side of the hand, the crease lines appear where the joints of the bones in each finger meet. To draw the main creases in the middle of each finger, just draw two curved lines like speech brackets turned on their side. Notice how these also sit on an arc, rather than a straight line? If you look at your own hand, you’ll also notice some smaller lines at the base of the first bone on each finger. You can sketch these in using some simple curved lines, just like in the illustration. At the base of each finger, there are some small diagonal crease lines where each finger meets the next. 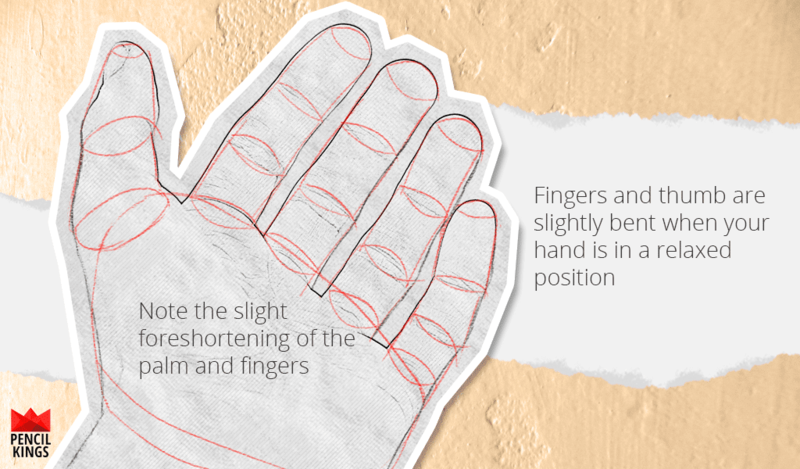 Now, follow this exact same process for drawing the crease lines on the thumb. 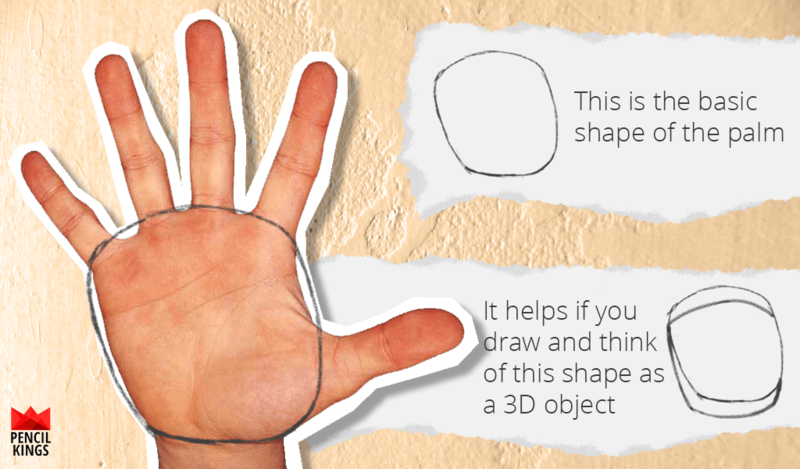 Now you’ve learned how to draw the basic shape of the hand from both sides, let’s take a look at how the fingers move and how you can draw them more accurately. 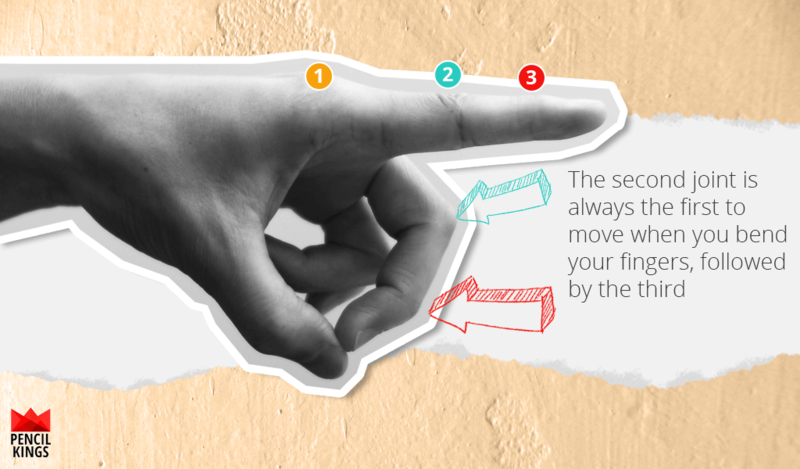 First, let’s take a look at how your fingers move without bending them. Look at the top of your hand and fan your fingers out as far as you can, like in the illustration above. Notice how you can only fan them so far? 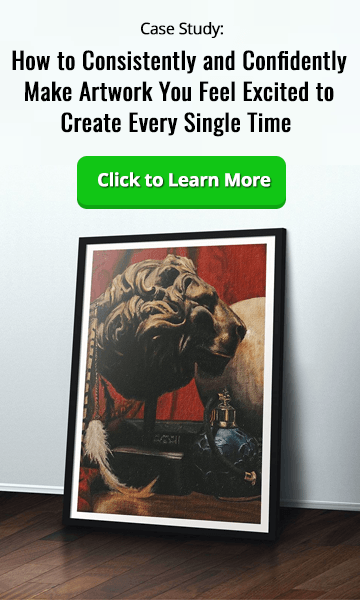 It’s the small details like this that will make a big difference to how realistic your drawings and paintings look. For this next exercise, we’ll use the length of the forefinger as our main reference measurement (measurement 1) like in the illustration. The maximum opening between the thumb and forefinger (measurement 2) is about one-and-a-half times the length of the forefinger (measurement 1). So, it’s measurement 1 plus half this measurement again. The maximum opening between your ring finger and little finger is the same length as the forefinger (measurement 1).Try it yourself by holding your first three fingers together and moving your little finger as far as it will go.You’ll notice the little finger isn’t extended as far as this in our illustration, but we’ve drawn the measurement anyway to show you how far it could go. The maximum angle possible between your thumb and little finger when fanned out is 90 degrees. Again, try it yourself and see this measurement in action. Now, let’s look at how the fingers move when you bend them. First, try bending your forefinger from a straight position into a curled position like in the illustration. It’s important to remember these small details when drawing hands, because they’ll help give your drawings a more realistic feel. Because we use our hands all the time, they’re rarely in one position for very long. Whether it’s holding a pencil, lifting food and drink to your mouth or even brandishing a sword, there are all kinds of different poses for hands. Follow along and draw the useful poses in our illustrations. These are a great place to start, because they’ll help you understand how the hand moves. And, once you feel more confident with your hand drawings, you can experiment with other poses if you like. Relax your hand and take a look at what’s happening. The fingers and thumb are curved or bent slightly. Because they’re bent, you might notice some slight foreshortening of the fingers. Don’t worry about this too much for now – we’ll go into foreshortening in more detail in our next blog posts on drawing hands. 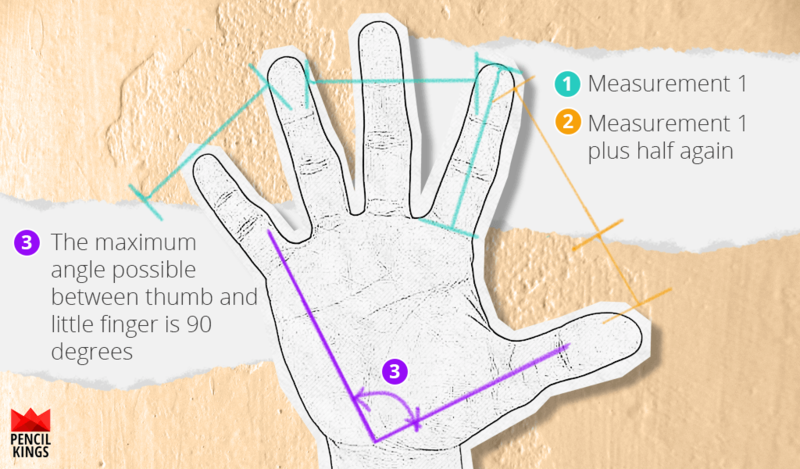 The creases in your fingers don’t fall on a straight line – in fact, they fall on an arc shape, like in the illustration. You can also see this arc shape in your knuckles and the joints in your fingers. First, clench your fist and take a look at it from the front. Your knuckles are raised and sit on an arc shape. The thumb is bent around your fingers. 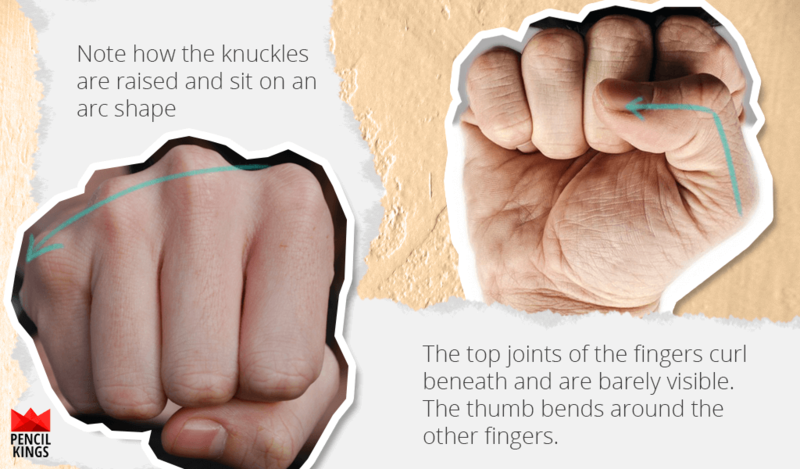 Practice drawing your fist from this angle, and take a look at the image above for guidance. Now, let’s view that same clenched fist from the other side (from below). The middle joints of your fingers aren’t level with each other. Instead, they sit on an upwards angle like in the illustration. Your basic ‘steak’ shape bends in the middle – roughly at the bottom of the thumb. The thumb is bent in the middle and in three-quarter view. It roughly lines up with the middle joint of your index finger. Depending on how tightly-clenched your fist is, you might not see the tops of the fingers at all. If loosely-clenched, then the top parts of each finger will appear foreshortened. Our fingers can adjust to hold many different things, and it’s useful to have an idea of how some of the main poses look. Pick up a pencil or pen and hold it in your fingers like you were writing or drawing. Notice how your fingers bend and position themselves to ensure a comfortable grip? Your index finger is the one with the most control. Your middle, ring, and little fingers curl back towards your palm. 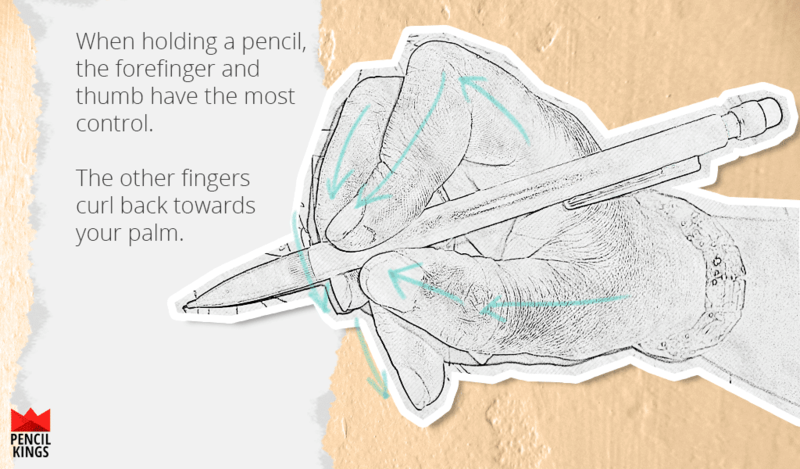 Your thumb works with your index finger to keep the pencil (or pen) in place. 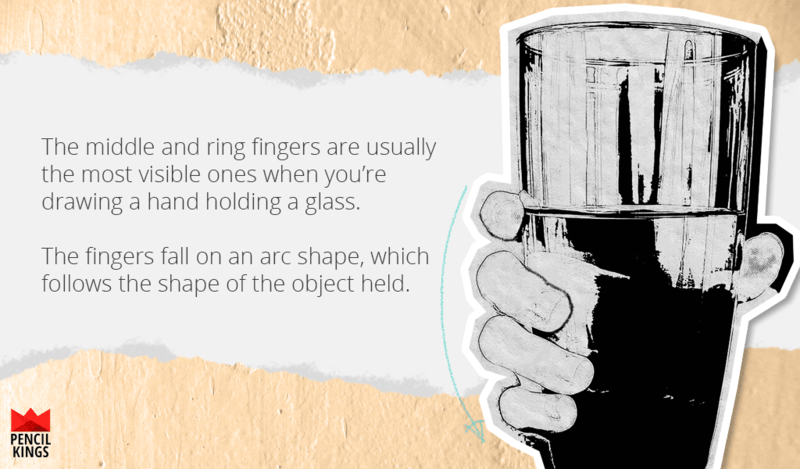 Now pick up a glass and look at your hand. Notice how your fingers have automatically bent and formed themselves into the best position for doing this? Of course, there are lots of other hand poses for you to practice. These are just some examples to help get you started and become more familiar with the proportions of the hands and how the fingers move in different situations. If you’re serious about drawing hands, spend 15 minutes a day drawing them in different poses such as the ones in this article. 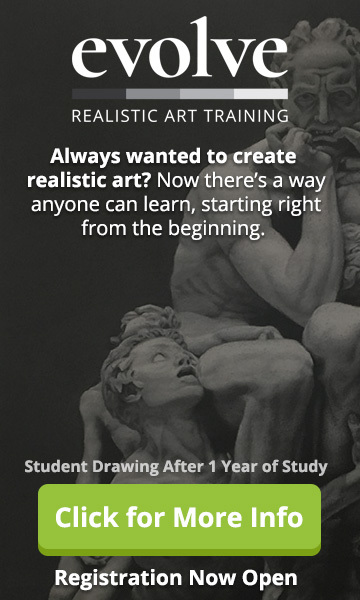 You’ll be surprised at how quickly everything starts to make sense, and how your drawings gradually start to look more realistic. If you enjoyed this blog post about how to draw hands, why not leave us a comment below? Very nice info on how to draw a hand. Lots of quick memory tricks to make the hand look very realistic. 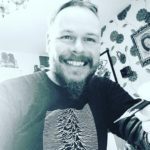 Hi Karen, thanks so much for your feedback 🙂 I really enjoyed putting this blog post together, so it’s great to hear you found my tips useful. Stay tuned for part 2 of this series, where I’ll go into more detail on hand poses, different types of hands, and shading & coloring techniques to help you start adding form to your drawings. Love it , very helpful details. Thanks soo much. Love the information. Thanks. I have trouble with hands. Ayy! That’s pretty good! I will practice every day. No more mitten hands. Love the hand class.The time you put in the drawing was and is terrific. Like how you explained the length of the fingers in relation to each other and the thumb. Excllent class. I learned a lot. Hey Mary, thanks for your feedback 🙂 I’m really glad my article on drawing hands has helped you and I hope you have lots of fun sketching. The great thing about drawing hands is you’re never stuck for a subject to practice drawing with – it’s right there at the end of your arm! Very well explained! Easy to follow and good points.